This is the story of my motorcycle Adventure around the world which I started in 2007. Having already ridden through eighteen countries from Australia to Ireland I’m once again hitting the road. 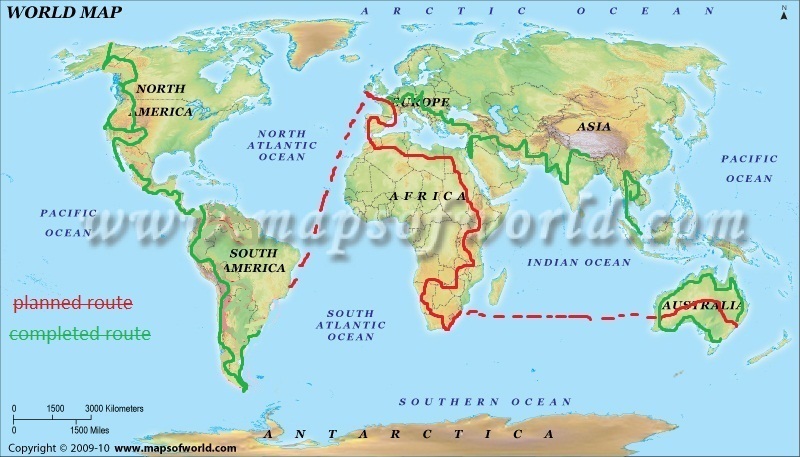 I’m now setting out to explore North, Central and South America followed by Europe and Africa. If you would like to follow my journey just subscribe at the bottom of the page. Please feel free to leave comments, I hope you enjoy the trip. hope you guys. Are well. You’ll love it out here. Beautiful place. I met you yesterday at a little cafe on the side of Kootenay Lake on the way to Nelson. Riding a KLR from the Horizons Unlimited gathering in Nakusp. Hi Mike, it was good to meet you. Are you still in Frisco? southern Nicaragua and Costa Rica have been a hoot and a half…Ride safe my friend and see you in Australia. Zoran: Just stumbled across your blog…..looks like an awesome adventure, have a great trip and stay safe. Hi Carol/Zoran, great to hear from ye. Thanks for ye’re condolences . It’s been a very hard month for sure. I hope every things well with ye anyhow. I meant to send ye a link ages ago but forgot, just presumed Daren would have given it to ye I guess. I found u thru a post a out your “deathring” key/ignition problem (hardpackrider on advrider forum), wow was I uninformed!… here I thought u were some guy grumbling about one misfortune on a one-off trip!! I have since read all of your posts (well.. back three months anyway.. ) and wow am I blown away. I was right about one thing… I can’t imagine ANY adv rider that is not extremely jealous of what you’ve chosen to and are able to do. truly an adventure of a life time. kno, as I sold my xr650L 6 mos ago, and am very close to buying my first GSA… I am very much enjoying reading your posts, as I commute on the BART train to and from my pressure cooker job in SF, CA. i felt for u… hearing about the passing of your mum, and also your old friend… Sincerely, sorry for your loss. Also, The accompanying message “you’re only here for a limited time.. make the effing best of it” feeling transmits loud and clear. please be safe, and continue your amazing trip for as long as your able.. hopefully I’ll be on the road soon. We will still be heading to the states in April/May. We will be doing the Tat and just a good exploration of the country. We will be travelling by ourselves so if you know anybody who is keen to come along at any stage please let them know.